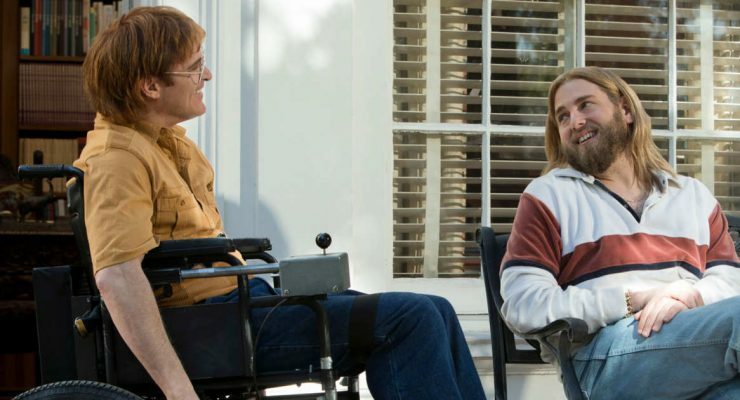 Don't Worry, He Won't Get Far on Foot - Upstate Films, Ltd.
Over the span of his career, Gus van Sant has brought us My Own Private Idaho, Drugstore Cowboy, To Die For, Good Will Hunting, Gerry, Elephant, Milk, and more… In his latest film, Joaquin Phoenix stars as John Callahan, a man who overcame addiction after a life-changing accident and developed into a nationally recognized artist known for his edgy, often controversial cartoons. The last day Portland slacker John Callahan is able to walk, he wakes up without a hangover because he’s still drunk from the night before. That night at a wild party, he meets a wisecracking drinking buddy (Jack Black) who insists they leave for an even better party. But when his new friend dozes at the wheel, John wakes up confined to a wheelchair with only partial use of his arms. Though he initially has no intention of getting sober, he reconnects with Annu (Rooney Mara), a therapist he met at the hospital. And he reluctantly attends a 12-step meeting run by a charismatic openly gay man who conducts unorthodox recovery sessions from his lavish mansion (Jonah Hill). With their encouragement, John discovers a hidden talent for drawing and channels his playful personality into crude, politically incorrect — and often hilarious — cartoons. Based on a true story and adapted from Callahan’s autobiography, the film sings with creativity and a feel-good ‘70s vibe. R / 1 hr 54 mins.